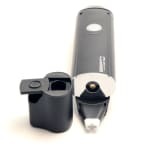 The Prohibited 5th Degree Dabber Cartridge extends the functionality of the 5th Degree Vaporizer as a dab wand / portable nectar collector. NOTE: requires the Prohibuted 5th Degree Vaporizer. Add on. Not a stand alone unit. 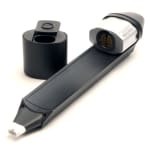 The convenient, drop-in magnetic cartridge features a removable glass airflow channel for easy maintenance between uses. The replaceable tip utilizes a Quartz / Titanium heating element, allowing for precise dosage and conservation of your concentrates. This touch-and-go device eliminates the need for concentrates tools and messy loading. Use the convenient built-in silicon reservoir to store your concentrates safely inside the magnetic base for handy on the go use - just press the activation button to heat the tip, touch the heated tip directly into your concentrates, and enjoy!